Beaver Creek Discount Ski Rentals Book Christy Sports! 20% off at the base with Christy Sports if you book here! Christy Sports is at the base and offers 20% off of rentals if you order ahead. Just Fill In This Form, then you are free to call the store to make sure your order is really right for your family. 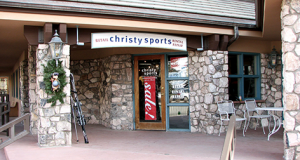 Call(970) 949-5576 for Christy Sports in Beaver Creek Ski Resort at the Base.